The data set for the Stock Analyser project may include companies that have listed or delisted during the analysis period. Alerting the user to situations when the analysis window includes Out of Data events adds a power boost to the Stock Analyser functionality. In the xlfAnimatedWorksheets shown in figure 1, an Out of Data switch in cell D3 triggers content and format changes of an alert range in B6:D8. Note: Assume that Page > Layout > Themes > Theme > Office is set, because the colours in this module are from that Theme. The switch is simply a place holder for the return value of logical functions elsewhere in the workbook. In this module, the alert range is blank when data is available. However, the blank range has a coloured background to deter users from inadvertently overwriting the cell formula. To enhance the alert range, its size is increased by merging some cells and then applying a format. 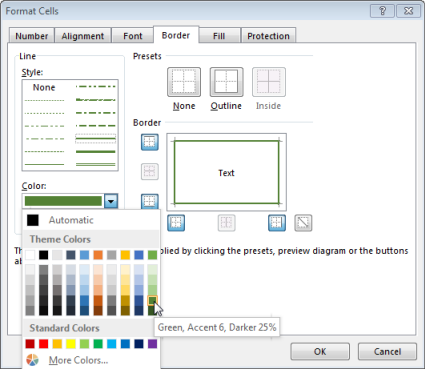 The merged cells are now identified by the upper left cell, B6 as shown in the Name Box. Colour the border. Home > Font > click the Font Dialog Box then Border > Color > Green, Accent 6, Darker 25%. (See figure 2). 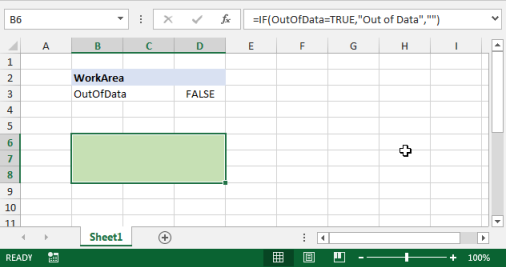 B6: Enter the formula =IF(OutOfData=TRUE,"Out of Data","") as shown in figure 3. Select cell B6: Apply a conditional format. Home > Styles > Conditional Formatting > Highlight Cell Rules > Text That Contains > Format cells that contain the text: Enter the text string Out of Data from the value_if_true argument in the IF function in item 6. Then select the Light Red Fill with Dark Red Text property. See figure 4. Fig 4: Conditional format - for "Text That Contains"
A cell can have more than one conditional format. To manage the condition format rules, for the Current Selection or This Workbook, click - Home > Styles > Conditional Formatting > Manage Rules > Conditional Formatting Rules Manager in figure 5. Finally, the Out of Data switch in the range OutOfData needs to be linked to the a set of logical formulae. Normally, IF, AND or OR, and possibly NOT are all that is necessary.